Greetings from El Paso, Texas! I can see why El Paso is nicknamed the Sun City – it was 92 degrees today. Quite a treat after the unseasonably cold weather in Boston. It’s beautiful here. Picture a southwestern city with open vistas, big skies, and mountains in the distance. The Plaza Theatre, where we taped the show, is one of the coolest theatres I’ve ever seen. The inside of the auditorium looks like a piazza with sconces and wrought iron banisters, and the ceiling is covered in stars that actually twinkle! The show was an especially inspiring one. All of the young musicians were recipients of our Jack Kent Cooke Young Artist Award, and they were introduced by From the Top alums, who had received the Award in the past. There were so many memorable moments during the show, but one that stood out for me was a teenage cellist who spoke about his struggle to overcome a major illness before going on to win the Sphinx Competition. His positive attitude really struck me, not to mention his musicianship. The performances were all top notch as per usual, and the show closed with an absolutely gorgeous choral piece by the El Paso Choral Society Young Ladies Choir. The audience leapt to their feet during curtain call, and a representative from the Jack Kent Cooke Foundation handed out medals to all of the performers. After the show, we all went on to a reception at the OLO Gallery which showcases artwork done by children in an arts education program called Creative Kids. I was admiring an especially impressive painting of a clarinetist done by a six year old, when an announcement was made that the children who created the paintings were in attendance. 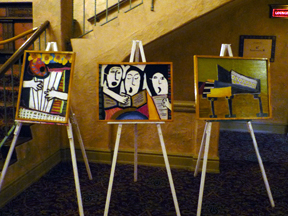 Then these tiny artists, all under the age of seven, stood in front of their paintings while it was revealed that each one was created in honor of one of the musicians who performed on our show that evening. It was so beautiful to see our performers standing beside the paintings that were inspired by them! Check out these photos, and make sure to tune in to this episode, airing during the week of October 19th!